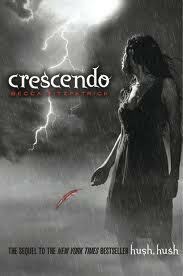 Recently, I acquired an ARC of CRESCENDO by Becca Fitzpatrick. I am pretty certain that the person who had it was clueless about how many people would do just about anything to get their hands on it. I started to think about it and decided that rather than keep it solely for myself I would hold a contest. But I didn't want to hold any contest. I decided I wanted to connect it with something that is really important to me. Early literacy is a big concern of mine. How do we help children get excited about books and reading?! Rather than just have people comment about why they want this ARC or have you follow the blog. There will be some challenges which will help support literacy and earn you entries. 1. All participants must complete an entry form. 2. You must be 13 or older to enter. 3. On the form, there are some required items that anyone can complete in order to enter. To earn additional entries, there are some challenges that I believe most people can complete but are not required in order to enter. 4. The contest is open internationally. International participants - if you are unable to complete something because it does not apply to your country, please email me at: kidlitfrenzy(at)gmail(dot)com. 6. The contest will end at 11:50 P.M. PDT on August 23, 2010. Click here to complete the entry form. Please email me at kidlitfrenzy(at)gmail(dot)com if you are unable to access the link for the form. In "Ally Condie", "Becca Fitzpatrick", "Contest", "Contests", "Crescendo", "Matched"